A small an inexpensive piece of mind! SRAM chains rule - I run one on my Shimano 11spd road system and the ability to field repair with a speed-link is key. It's a must have part for any repair kit. 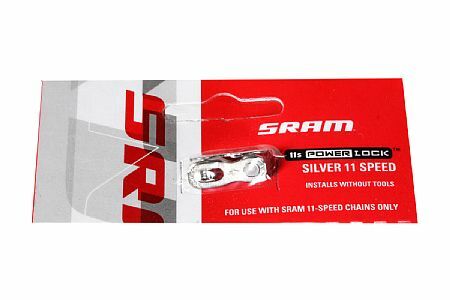 I much prefer the SRAM chains to the Shimano precisely because of the powerlink. I don't track how many miles I get from chains, but I'm happy with what SRAM gives me. The only way to go if you remove your chain regularly for travel or cleaning. My wife and I do a lot of travel to tour with a Ritchie Breakaway and a S&S coupled Ti bike.... that requires pulling the chain every time we pack the bikes. I use a Park tool (not sure what number) to open the Power lock (you can do it by hand but if new it is difficult) and re-use the links. We do maybe 500-1,000 miles every trip, so we probably re-use the links about five or six times before I replace the chain. Never had an issue with re-use. I save the old links and put one or two in my minimal road repair kit.. years ago a dropped chain got sucked and kinked, it was an easy fix to remove the kinked link and replace it with a spare Power Lock. The chain was shorter but it got us home. Can't imagine what I would do without these things. Outstanding product that is simple, yet effective. The Powerlock link is outstanding. I bought several of these to make traveling with my bike easier. Now, I simply take the chain off when I disassemble my bike, clean it, and place it in a plastic baggie before packing my bike in my bike bag. The Powerlock links make reassembling the bike, and chain, extremely easy. I keep a Powerlock link in my Continental seat bag as well as in a Stickypod bike bag that I place in a jersey pocket. The Powerlock link makes fixing a broken chain simple (not that broken chains occur very often, but having a link that can fix the problem in a few seconds is well worth the few dollars that it costs). I've never had the problem with them being tight on 10 speed chains and I suspect that I just unfortunately got a bad one. I always keep one or two for emergency repairs. A must-have for any cyclist. I keep one in every pack and seat bag. Have no problem using it with an ultegra 11 speed chain. Why get stuck in the middle of your ride. Keep one of these on hand with your spare tube and tool. Excellent, used it on my 11-speed XTR chain. Works well with Chorus chains. Easy to use.